We've moved long distances (2500 or more each time) 3 times in the past decade. We've taken less with us each time. The first big move we made came almost 7 years into our marriage when we moved from New Hampshire to Portland, Oregon. We hired a moving van, but packed everything ourselves. Eight years later we moved from Portland to Fairbanks, Alaska. This time we had a U-Haul. Bill, Heather and I were in that and a friend and his son were in our truck with our animals in back. We bought them a plane ticket home. Even making the trip with extra people and paying for lodging, food, and their airline tickets, it was still cheaper than it would have been to hire a moving company. Nine years after that, we were moving from Alaska to southern Oregon. This time we decided to leave all the big stuff behind and mail ourselves boxes of other stuff. We mailed 22 boxes to ourselves. Some of these were plastic totes, which we used again for the next move! When we got to Oregon, we set out looking at thrift store to find furniture. We found what we wanted and later got a few things on freecycle. A friend let us use a kitchen table and chairs that had been her mother's. We did buy a new mattress and tossed it on the floor and later a friend gave me a mattress and box spring that was practically new but that she couldn't use. There hadn't really been much in the way of thrift stores in Fairbanks--just a Value Village--but there was a spot at the transfer station where people could leave items that were still good for other people to take and use. When we left Fairbanks, we brought a lot of stuff there. Five years and two weeks after arriving in southern Oregon, we were off again, having freecycled a lot of stuff and given other stuff to people that wanted it or to the local Hospice thrift shop. We headed east and took 99 days to go across the northern part of the country before stopping in Niagara Falls for 5 months. We had almost nothing, but we slept on our air mattress until we got a futon to toss on the floor. The Salvation Army store was just down the street from the motel we were staying at, so we could go get some dishes and things before moving into our apartment. Once we got the truck unloaded, we went back and found chairs and a plastic patio table. Nice and light and easy to carry upstairs, so we used it as our kitchen table.The guy who had been living there left the couch. After Niagara Falls, we landed in Maine and once again got what we needed at thrift stores or from Craigslist. We'd left 10 boxes behind with a couple of different friends in Oregon, and when we were settled in Maine, they mailed them. These were mostly books, but there was some other stuff, too. By the time we got it, it was a year and a half or more since we'd left and I honestly wondered why I had felt the need to pack some of that stuff. We donated a lot of it to the local thrift stores and sold a couple of things on ebay. When we left Maine a few months ago, we were down to bringing 4 checked-in bags and a carry-on apiece. I chuckle at the thought of how we brought a little less each time we've moved. This time there was no need to look for pots or pans, plates and bowls, furniture or appliances. We walked into the flat and just about everything was here. We did walk down the street and buy pillows, sheets, and towels (we bought these new). Apartments and rental houses seem to almost always come furnished. You can see how this affects the kind of stuff that the charity shops sell here. We've been in the couple that are here in town and some in different towns, and what we see is mostly books and clothes. There are usually a few bits of bric-a-brac as it's called here, and a few bits of kitchenware and rarely some furniture, but mostly it's clothes and books. 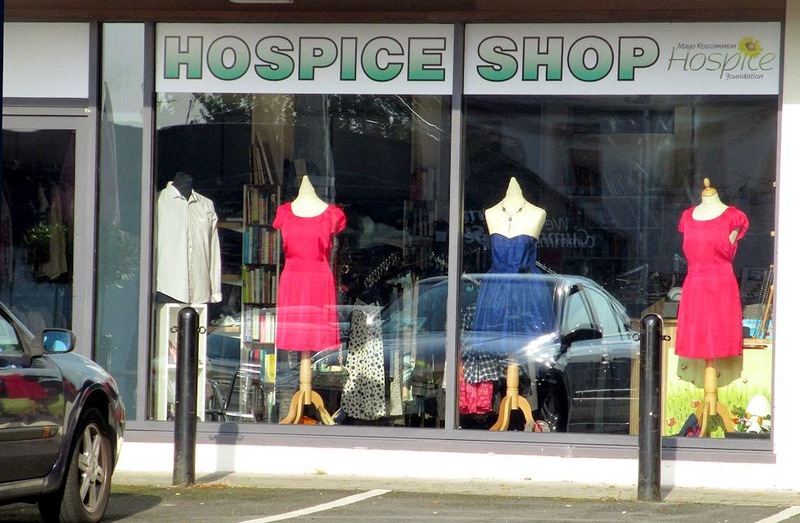 Here in Ballinrobe, we have two shops--one benefits Hospice and one supports people with sight loss. I have bought clothing to wear at each one and of course, we've gotten lots of books at each one as well. They are both good stores. I have wished in the past that there was a larger selection of things like larger bowls and bakeware and stuff like that. I had to go buy a few things like that at the 2 euro store rather than buying used, as I prefer--looking for something secondhand is always my first choice, but it's not as easy here, since the charity shops just don't get many donations of such things. There are often signs in the window asking for donations of housewares, furniture, and bric-a-brac. 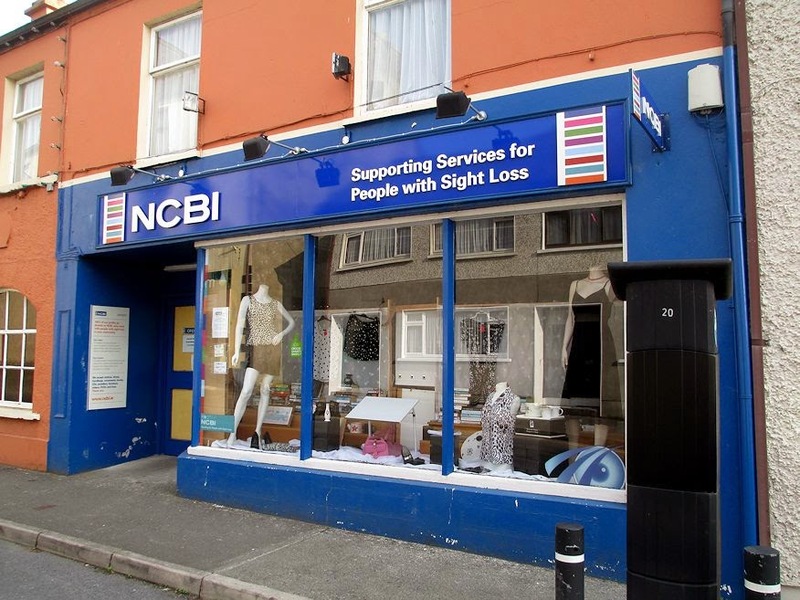 When we walked by this morning, I was pleased to see a sign in the window of the NCBI shop that stated that they were having a sale on children's clothing--25 pieces for 5 euro. That is a great thing because families are large here and school costs are quite high. Kids wear uniforms to school, but it's good that parents can get a break on clothes for non-school hours. I'm sure many really need it!